Summary: I’m always hearing about how my brain doesn’t work right. . . . But it doesn’t feel broken to me. Olivia Donatelli’s dream of a “normal” life shattered when her son, Anthony, was diagnosed with autism at age three. Understanding the world from his perspective felt bewildering, nearly impossible. He didn’t speak. He hated to be touched. He almost never made eye contact. And just as Olivia was starting to realize that happiness and autism could coexist, Anthony died. At this year's BEA, I was fortunate enough to attend a special panel hosted by Carol Fitzgerald of ReadingGroupGuides.com fame. I had the opportunity to hear what various publishers were suggesting for fall/winter book club picks. They had just a few minutes to make their "sale" before the bell rang and they had to move on to a different table, and I thought it was loads of fun! I was like a kid in a candy store, only I was drooling over calorie-free options. 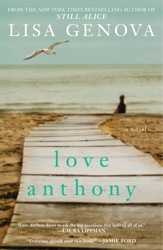 So many of the books truly appealed to me, but perhaps none more so than LOVE ANTHONY by Lisa Genova. I am positively ashamed to admit this, but LOVE ANTHONY was the first novel that I've read by Ms. Genova. My book club read STILL ALICE a few years ago, but I knew I was going to miss the meeting and just skipped the book. Of course, I know that many readers rave about her books, but sadly, I hadn't experience the power of her writing until these past few days. On one hand I'm thrilled to finally "discover" her, but on the other hand, I'm kicking myself for waiting so long. LOVE ANTHONY is a deeply moving novel about two women, Olivia and Beth, whose lives are brought together by a young boy who had autism. Olivia seemingly had it all -- a great husband, a successful career, and a beautiful baby boy named Anthony. That is, until she began realizing that something wasn't quite right with Anthony. He didn't speak or make eye contact, and he never really wanted to be touched; so it wasn't really a surprise when her son was diagnosed with autism. Olivia and her husband tried everything to make Anthony "normal," and eventually their actions began to break apart their marriage. Just as Olivia was coming to terms with Anthony and accept him for who he truly was rather than change him, he unexpectedly died. Recently separated from her husband, Olivia moved to Nantucket and tries to begin the process of healing. Unfortunately, she is unable to move on until she comes to terms with the meaning of Anthony's brief life. Beth, on the other hand, lives on Nantucket with her husband and three children. She has amazing friends who are a great support system, but she still feels as if she is alone and missing out on something. When she receives a letter telling her that her husband has been having an affair, Beth's world quickly comes crashing down. However, this pain gives Beth an opportunity to rediscover herself -- namely her creativity and writing. She begins to write again and is inspired by the voice of an autistic young boy -- eerily similar to Anthony. This writing allows Beth to find herself again and gain the confidence she needs to move forward with her life. It's because of Anthony's words that Olivia and Beth are brought together and eventually begin their healing. LOVE ANTHONY is an extremely touching novel which explores many difficult issues including broken marriages, motherhood, and autism. However, it also offers a fresh look at unconditional love, healing, friendship, self-discovery, second chances, and forgiveness. I thought it was a beautiful story that both broke my heart and, at the same time, made me grateful for my life. One thing I have to commend Ms. Genova for is her ability to handle a difficult subject, like Alzheimer's or autism, in a fair and honest way. For those of you who don't know, Ms. Genova is a neuroscientist with a Harvard degree who worked as a research scientist before becoming a writer. (I'm very jealous of both her intelligence and her creativity!) In LOVE ANTHONY, she tackles autism which affects about one out of ever 88 children -- unbelievable, right? I thought she did an amazing job of making Anthony real and giving a voice to a child who is unable to communicate in a way that we expect. There is so much about autism that we still don't know; however, I loved that reading this novel gave me a new way to think about it. Another wonderful thing about LOVE ANTHONY was that it delved into themes that are basic to every human being (whether we admit it or not) -- the need to feel wanted, the need to feel happy, the need to feel safe, and the need to feel loved. Both Beth and her husband addresses these needs with the help of their therapist as they attempted to reconcile, and I couldn't help but think if they had been able to communicate their needs to each other, that their marriage never would have suffered. I think we could all take advice in assessing our own needs as well as our loved ones' needs. However, I also appreciated that Ms. Genova defined these same needs for Anthony; and it made me see him in an entirely new light. I guess people aren't as different as we first might think! I also really liked how the story (or should I say stories?) in LOVE ANTHONY was told. The majority of this novel alternated between Olivia and Beth; and since they didn't really become involved with each other until almost the end of the book, their lives were pretty separate... except that the author kept weaving similar themes into their lives. I loved that! In addition, I liked that Olivia was revisiting her journals from the times when she was trying to come to terms with Anthony and his autism, and I thought these snippets were so honest and so touching. Furthermore, I liked that I was given the chance to actually "hear" Anthony in his own words through Beth's writing. It was almost as if there were three separate storytellers given that the book was written in third person and then there were Olivia's journal entries and Anthony's voice by way of Beth's writing! As I'm writing this review, I've come to realize that I could write about ten more paragraphs about things I enjoyed in LOVE ANTHONY. That should probably tell you that this novel would make an excellent discussion book. The folks at Simon & Schuster were right for featuring LOVE ANTHONY as an ideal fall book club pick! There is a reading guide available with fourteen thought-provoking questions. I actually found most of them to be excellent; however, this book is so ripe for discussion that I'm not even sure you need a formal guide. Some of the themes you might want to explore include motherhood, marriage, love (and unconditional love), friendship, divorce, grief, self-discovery, loneliness, the process of healing, second chances, happiness, forgiveness, and faith. Overall, I thought LOVE ANTHONY was a powerful story and one that most definitely touched my heart. Highly recommended! I first heard about this book at the same event at BEA. I've never read Genova either, but have been excited about this book ever since then. I'm so glad to hear it's so good! I adored STILL ALICE but haven't read LEFT NEGLECTED yet. Genova really has a way with words and I have no doubt this will be another successful book for her. Will have to read this one soon! I haven't read anything by this author either, though I have Still Alice somewhere on the shelf. This one sounds good too. I liked her first two books so much, and haven't read this one in part because reviewers say it's not as good, but also because the premise doesn't appeal to me as much anyway. I've read and loved her first two books, so I really want to read this one. So glad you loved it!